* The Korea Institute of Public Administration makes policy suggestions to revise the Foreign Workers' Employment Act, the Dispatched Workers' Protection Act, and the Employment Security Act. * The Ministry of Employment and Labor responds the suggestions are "impossible to invoke in reality, and most of them are not reflected." The Korea Institute of Public Affairs(KIPA) singled out a bunch of labor regulations to be removed so as to foster new industries and new technologies. The policy suggestions for the regulatory revision include a clause for 'special cases concerning employment of foreign workers' in the Foreign Workers' Employment Act by which foreign workers are allowed to be employed only in the prescribed industries and another clause in the Employment Security Act by which the labor supply services are restricted with few exceptions. The KIPA released a 'Study on the Development of Improvement Items of a Negative Regulatory System under the Jurisdiction of the Ministry of Employment and Labor(MOEL)' on February 7 that 24 regulatory items were singled out as the regulatory improvement items under the MOEL's jurisdiction. 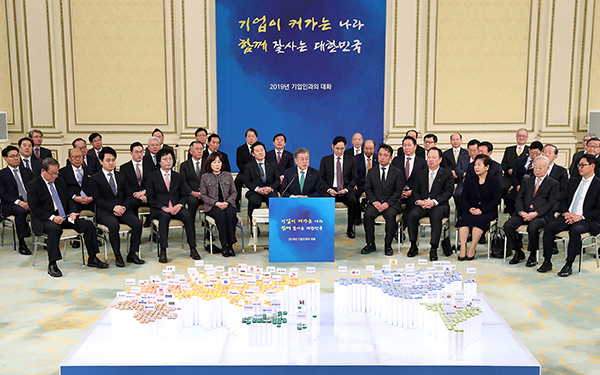 The policy improvement toward a negative regulatory system is a policy task of the Moon Jae-in administration. The government strives to change the rigid and restrictive regulations to be flexible and the 'sandbox' to be launched for 'permission first and regulation later' for the promotion of new industries and new technologies. Last year, the Office for Government Policy Coordination(OPC) has selected some 1,500 regulatory items under the jurisdiction of 33 government ministries and offices as the items for 'comprehensive negative regulatory changes' and instructed the ministries and offices to conduct surveys on the economy and society related acts, enforcement decrees and enforcement regulations for the changes toward a negative regulatory system. The MOEL also entrusted the KIPA to conduct a related study and the KIPA recently unveiled its study result. The study suggested that Article 12 of the Foreign Workers' Employment Act which limits the scope of workplaces where foreign workers are allowed to employed only in the construction, manufacturing, service, agriculture and fishery industries be removed in order to "increase the workplaces where foreign workers are allowed to be hired through the improvement toward a more flexible system, taking into account the current trend that workplaces with foreign workers are on the rise." Article 3 of the Enforcement Decree of the Dispatched Workers' Protection Act also became subject to review. The purpose of the article was to prevent the unchecked operation of many small labor supply firms and unpaid wages, for which the business licenses are granted to the labor supply firms satisfying the requirements of a capital of 100 million won or more and 20 square meters of office space. The KIPA suggested the article is 'unnecessary preconditions'. Article 33 of the Employment Security Act and Article 33 of the Enforcement Decree of the Employment Security Act, both of which aim to prevent intermediary exploitation, were also suggested to be revised, as it was deemed as a 'barrier to entry'. The MOEL denied the possibility of the institutional revision, only saying that "(the outcome of the study) is the opinion of a researcher." "The revision of the suggested laws can be a medium and long term subject to review, and most of them were not reflected into (the policies), because they were deemed impossible to invoke in reality."